There are more indications today that Russia is ramping up military pressure on Ukraine and that its slow-drip invasion may accelerate if an agreement is not reached in Minsk tomorrow. There are multiple reports that a column of 40 or more armored vehicles has broken through the border near Novoazovsk in the south of Donetsk oblast and are headed toward Mariupol, Ukraine’s primary port on the Sea of Azov.The Russian have been shelling the region from the Russian side for some time, and Ukrainian sources are claiming that the force that crossed the border today is manned by regular Russian military personnel using unmarked vehicles. The commander of Ukraine’s volunteer Donbas Battalion has asserted that a separate group of armor split off from the main force and is headed north toward the current zone of conflict. Photos and video evidence of fighting in the region has been posted on the Internet, as well as photos of a one-kilometer long line of cars trying to leave Mariupol and the stockpiling of water, food, and other supplies by those still in the city. 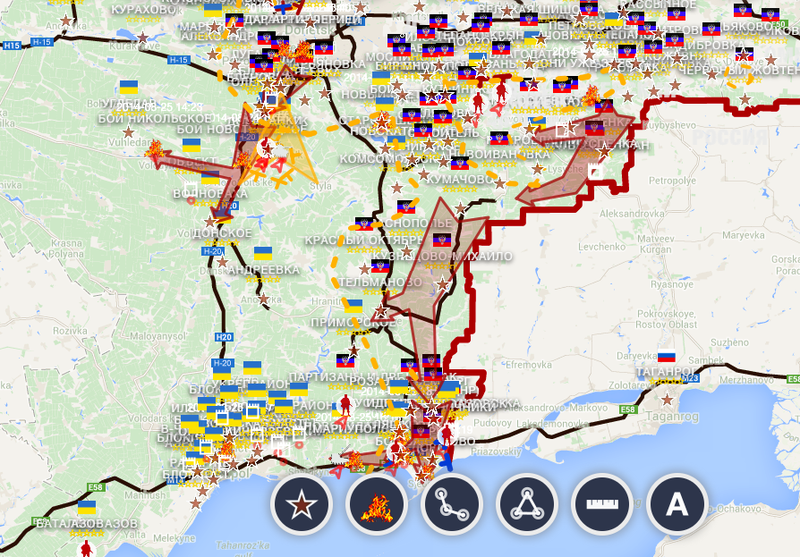 In addition, Russia appears to be stepping up military activity along the border to the north of Luhansk, including shelling and rocket attacks as well as marshaling of forces. Finally, Russian Foreign Minister Lavrov announced today that Russia intends to send a second humanitarian aid convoy into the Donbas. While the world was watching the White Truck Charade entering Ukraine at Izvarino border crossing, large numbers of Russian forces entered on all border crossings in the conflict zone. On August 24th the world watched at Ukraines (sic) Independence Day with a big military show off in Kiev. There was another ‘counter display’ of Ukrainian POWs to watch in Donetsk. 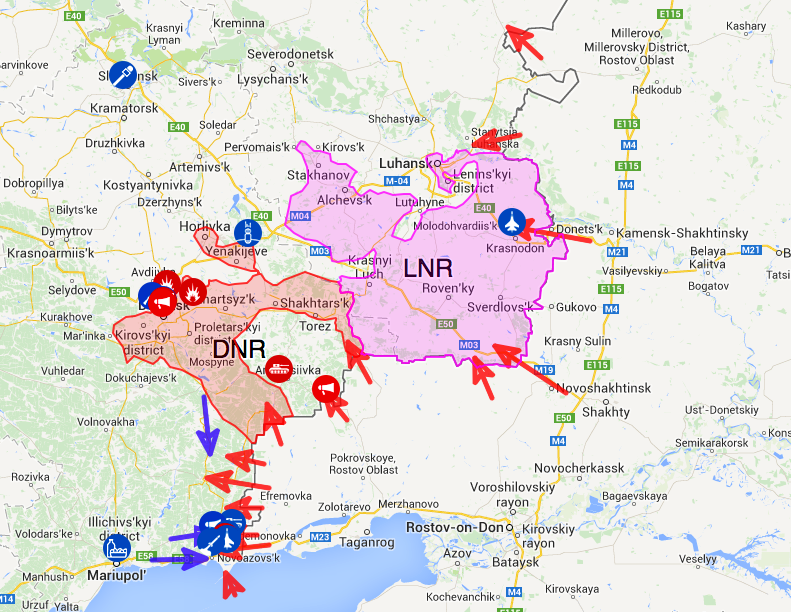 The following two maps are from sources supporting opposite sides in the conflict, but they agree on one thing, which is that pro-Russian or Russian forces are threatening to encircle the Ukrainians from the north and south (note, however, that the first (Russian) map does not have the offensive in the south originating in Russia). What Putin can offer Poroshenko in Minsk, then, is to stand down his forces poised along the border, to put an end to the flow of fighters and equipment across the border, and to undertake efforts to mend fences, however long that might take, including steps to start cooperating on the economic front. What is unclear, however, is what Putin is going to ask in return. Suffice it to say that Berlin has been sending mixed signals regarding its Ukraine-Russia policy, but the important point is that “federalization” is really not an option that Poroshenko can embrace at this point. One can imagine Putin (perhaps supported quietly by Berlin) telling Poroshenko, either directly in Minsk or indirectly through back channels, the following: I will order my military to return to its permanent bases, stop the flow of weapons and fighters to the separatists, tone down the rhetoric, reduce economic pressure generally, and compromise on natural gas pricing, but in return you must commit to constitutional changes providing for the “federalization” of the Ukrainian state and permanent Ukrainian military neutrality. Putin might also insist, presumably privately, on a commitment from Germany that the EU would prolong or derail the accession process for Ukraine, and perhaps also demand some kind of public commitment from Poroshenko that he is willing to put accession to the European Union versus the Eurasian Economic Union to referendum at some point in the future. A political agreement on this basis strikes me as highly unlikely, however. In the first place, Russia’s leverage over Ukraine is at its greatest now – in all likelihood, its invasion option will have disappeared by the onset of winter (and possibly earlier). Certainly the military option will be made much more difficult if Ukrainian forces manage to take control of Donetsk and Luhansk. But more importantly, Poroshenko is not only politically unable to agree to federalization in the face of Russian pressure, he is legally unable to do so. The Ukrainian president cannot offer constitutional amendments on his own even if he (or she) wants to. Any amendment requires support from two-thirds of the Verkhovna Rada, and amendments to certain chapters require additional approval in a nationwide referendum. Moreover, Article 157 specifically precludes any amendment that is “oriented toward the liquidation of the independence or violation of the territorial indivisibility of Ukraine,” and the Constitutional Court might well rule that federalization under Russian pressure is a threat to Ukrainian territorial integrity. What this means is that Poroshenko could at most indicate to Putin that he would be willing to put these kinds of constitutional amendments to the Verkhovna Rada for approval. (And there is no reason to believe Poroshenko himself would be willing to make that effort, even under both Russian and German pressure.) In any case, Putin would doubtless assume that any promise by Poroshenko to do so eventually would not be adhered to, and he would also know that there was little to no chance that the Ukrainian parliament would approve such amendments, at least today. As I have argued earlier, the only way that might happen would be if Russian military gains on the battlefield eventually convince the Ukrainian political leadership that the only way to avoid more defeats would be to concede to Russian demands. Finally, it is important to appreciate that there is no widely accepted, let alone legal, definition of the term “federalism.” As anyone familiar with the subject is well aware, self-identification (e.g., in a constitution) as a “federal” or “unitary” state tells one little about the relative authority of central, regional, and local governments. In any event, Moscow could care less about whether Ukraine is formally federal or not – what it cares about is an arrangement whereby regional authorities in Russian-oriented regions, particularly Donetsk and Luhansk, have effective veto power over Ukraine’s external orientation, treaties, and alliances. That, again, is not something Poroshenko can offer even if he wants to (which he doubtless doesn’t).